One of a number of different Balyna football games. 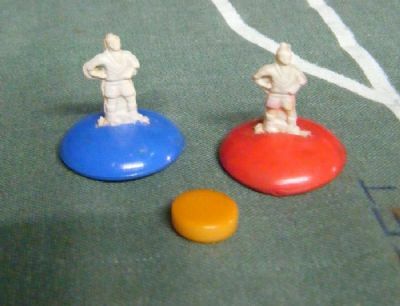 They also made magnetic football games but the No 1 sets use paddles to move the players. The No 1 sets had many different variants an dset contents. Some No 1 sets contain a robust aluminium border for the pitch and goals. The set was also available as a Junior edition. 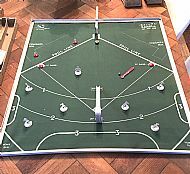 Balyna also produced a magnificent table baseball game, using most of the cricket set components it had a magnificent printed diamond pitch. 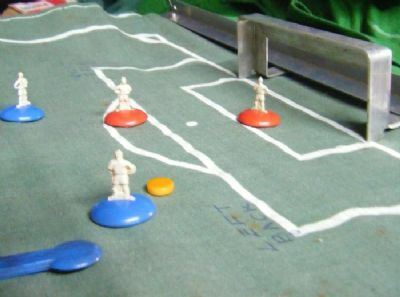 Comprehensive game includes pitch, figures, surround and goals made of aluminium, balls and 'paddles' to move the players around. This is the short box set for sale. It is complete and in excellent condition. A really unusual variation of the game. This is a No1 set supplied without pitch but with plastic goals that have real nets. It is 100% complete and very rare. The game came in different box sizes - longer and shorter as the contents and presentation were improved. This is the rarer longer box set for sale, complete in good condition (top box in photo). These are figures from the earlier versions of the non magnetic game with magnet bases added. This full boxed set of two teams with goals is extremely rare and available to buy. Pitch is made from material and the borders and goals from aluminium. Figures are crude plastic with bases moved around by flicking with a paddle. Very crude moulded plastic figures in bases and a puck type ball. These are the original net goals from the no1 set above.